A.J. Roloos has been named Baldwin's head football coach, the Bears' fifth since 1999. The school agreed with the recommendation of a selection committee. Both Roloos and co-finalist Rodney Figueroa were assistant coaches last season. Roloos steps in for Jimmy Morimoto, who stepped down when he and his family decided to move to the mainland. Baldwin was 21-2-1 under Morimoto, who succeeded Chad Kauhaahaa, now an assistant coach at Weber State. Roloos had been an assistant for seven years. Add Ciana Aiwohi to the growing list of girls basketball players sidelined by knee injuries. The Punahou guard joins twins Shawna-Lei and Shaena-Lyn Kuehu on the Buffanblu sideline. 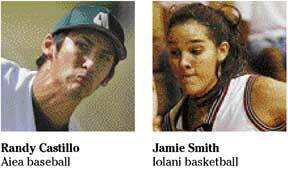 Kamehameha point guard Johanna Sai and Kaimuki forward Ashley Fortson were sidelined, as well. St. Anthony swept Kamehameha-Maui last week in a best-of-three series to capture their first Maui Interscholastic League baseball championship since 1978. St. Anthony will be playing in the state tournament for the first time since 1991. Ace Michael Jahns has led the Trojans, but sophomore Buta Wilhelm-Ioane and freshman Arrone Santos combined for a four-hitter in the title-clinching win over the Warriors. The Trojans, loaded with underclassmen, will not play again until the HHSAA/Wally Yonamine Foundation Baseball State Championships on May 9-12 at Les Murakami Stadium and Central Oahu Regional Park. He fired a four-hit shutout with six strikeouts against Kapolei and extended his shutout streak to 17 innings with 19 strikeouts and just four walks. She scored 20 points on 6-for-9 field-goal shooting and 8-for-9 free-throw shooting, and had 12 boards, five assists, four steals and three blocks against Punahou. Dustin Antolin, Mililani: pitched a three-hit, five-inning shutout against Waianae. He struck out six. Donovan Correa, Kalaheo: went 3-for-5 with a triple, three runs scored and an RBI against Farrington. Jason Fukumoto, Saint Louis: went 3-for-4 with a double and RBI against Pac-Five. Jonathan Ho, McKinley: went 3-for-5 with two RBIs against Kalani. Preston Nakata, Kailua: went 2-for-4 with a double, two stolen bases and two runs scored, and was the winning pitcher against Roosevelt. Brad Osborne, Radford: went 3-for-5 with a triple and three RBIs against Waialua. Justin Otaguro, Roosevelt: went 3-for-3 with a double and run scored against Kailua. Moses Sumia, Saint Louis: went 3-for-4 with a home run and three RBIs against Pac-Five. Matt Tanaid, Pearl City: went 3-for-4 with two triples and three runs scored against Waipahu. Hannah Adona, Parker: scored 23 points against Keaau and 23 more against Waiakea. Jazzmin Awa-Williams, Konawaena: scored 25 points, including six 3-pointers, against Kealakehe. Kanisha Bello, Kamehameha-Hawaii: scored 23 points against Waiakea. Jessica Dusich, Kaiser: scored 21 points against Kailua. Nicole Fu, Maryknoll: scored 20 points against Mid-Pacific. Whitney Hirano, Pahoa: scored 31 points against Kealakehe. Vicky Tagalicod, Hilo: scored 27 points with 12 rebounds, seven assists and three steals against Honokaa. Jesse Aulelava, Castle: fired a first-round 70 to lead the field in the OIA boys championships at Ala Wai Municipal Golf Course. Ryan Hironaka, Maryknoll: led the ILH boys championships with a first-round 69 at Oahu Country Club. Nicole Sakamoto, Kalani: carded an opening-round 74 to lead the OIA girls championships at Ala Wai. Kamakana Keola, Roosevelt: scored four goals against Kaimuki.